Below are common attributes associated to Visions Astilbe. Become a care taker for Visions Astilbe! Below are member comments regarding how to plant Visions Astilbe. No comments have been posted regarding how to plant Visions Astilbe. Be the first! Do you know how to plant Visions Astilbe? Below are member comments regarding how to prune Visions Astilbe. No comments have been posted regarding how to prune Visions Astilbe. Be the first! Do you know how to prune Visions Astilbe? Below are member comments regarding how to fertilize Visions Astilbe. No comments have been posted regarding how to fertilize Visions Astilbe. Be the first! Do you know how to fertlize and water Visions Astilbe? Below are member comments regarding how to deal with Visions Astilbe's pests and problems. No comments have been posted regarding how to deal with Visions Astilbe's pests and problems. Be the first! Do you know how to deal with pests and problems with Visions Astilbe? 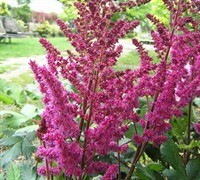 'Visions' Chinese Astilbe is easily grown in average, medium, well-drained but moist soils in part shade to full shade. They prefer moist, humusy, organically rich soils. Soils must not be allowed to dry out. If regularly watered, foliage will usually remain attractive throughout the growing season. A summer compost mulch helps retain soil moisture. Chinese astilbes are generally noted, however, for having better sun and drought tolerance than other species of astilbe making them the perfect choice for the South. Removing faded flower stalks will not prolong bloom but may improve plant appearance, particularly if a ground cover look is desired. On the other hand, many gardeners leave the flower stalks in place after bloom because of the continuing ornamental interest of the dried seed heads.